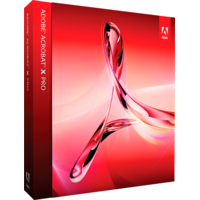 Adobe Acrobat X Pro is an update of revolutionary Adobe product – the Acrobat offering an ultimate set of tools for creating, converting, managing, sharing and cooperating on PDF files. The X Pro release has got few updates and improvements. The software initially is built upon Acrobat X Standard and inherits its core features. The major improvement, users will notice, is all new Tools task pane ensuring simpler and faster access to necessary options and tools. The new tool panel proves not only the simplicity of use of Adobe Acrobat X Pro, but shows it power performing the number of instruments and features available in a single application to enhance the PDF workflow. Now the options provided in the Adobe Acrobat cover any task from creating an XML-based form to commercial printing. Editing and managing a PDF file can be a real challenge even for a pro user as this type of document requires too much of specific instruments to make it look professional. The Pro X version provides you with everything to create pro PDF documents. Adobe Acrobat X Pro users will enjoy adding maps and 3D objects to PDF documents. Another feature, to improve the quality and efficacy of every PDF document you create, is an ability to add audio files to the documents as well as video files and other interactive content which may improve communication of your idea to your target audience. With Adobe Acrobat X Pro the PDF documents will never be static as on paper. The presentation created in Adobe Acrobat X Pro can add any file of any format you have access to, the files should not necessarily be in PDF format. The presentation then uploads all chosen files in a chosen layout and will offer you a set of tools to manage the content you have uploaded. Apart from choosing a layout for your presentation, you can set a theme and change colors of background, setting gradients, opacity and blurring of the elements. The portfolio has also got new web capabilities in Adobe Acrobat X Pro. You can now add web-based content to be viewed either directly in the document or opened and viewed in a browser. A finished portfolio can be uploaded online and being shared with links.